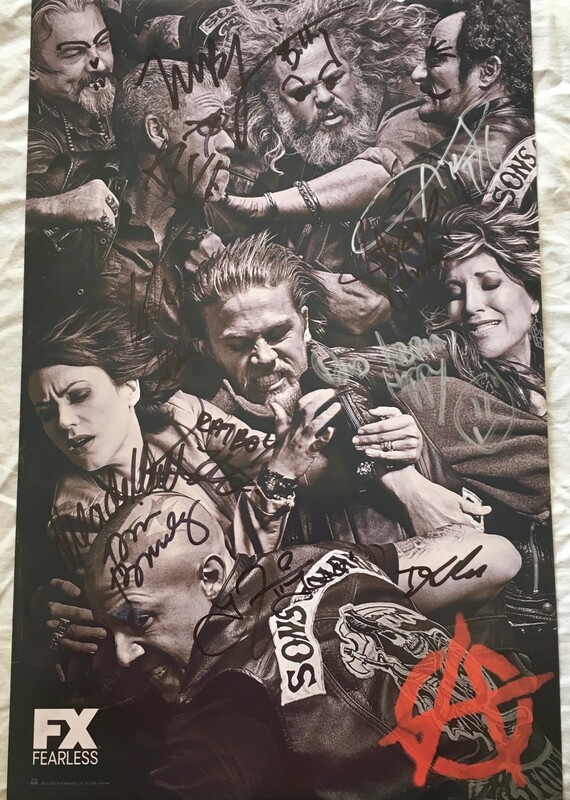 Roughly 11 by 17 inch mini promo poster for the hit FX TV show Sons of Anarchy autographed in black or silver marker by creator Kurt Sutter, executive producer/director Paris Barclay, and stars Katey Sagal, Kim Coates, Mark Boone Jr., Tommy Flanagan, Theo Rossi, Dayton Callie, David Labrava, Niko Nicotera and Drea de Matteo for a total of 11 signatures. Obtained in person at extremely limited 2014 San Diego Comic-Con signing. This signing started late and ended with dozens of people still in line, therefore the 2014 autographed poster is probably twice as scarce as the 2013 poster. 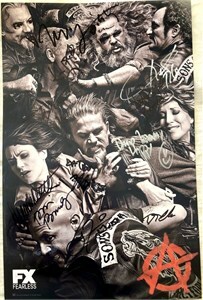 Also, with the show ending, this obviously was the last cast signing at Comic-Con or anywhere else. PERFECT MINT CONDITION. With certificate of authenticity from AutographsForSale.com and photo from the signing. NOTE: Flanagan doodled on Boone's face. Shown is the exact poster you would receive. ONLY 2 LEFT. LIMIT ONE PER CUSTOMER.